He’s been nursing a cold and stuffy nose for almost two weeks. I can tell he can barely breathe through his nose. Guess it’s time to call the doctor about a possible sinus infection. 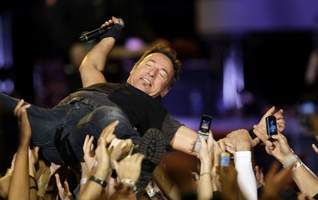 An article about Bruce Springsteen by Joe Heim in The Washington Post, December 16, 2009, began with the image of him crowd-surfing. During his concert at Giants Stadium on Oct. 3, just a couple of weeks after he turned 60, Bruce Springsteen did something no one remembers him doing in many, many years. Early in the set, during the song “Hungry Heart,” he made his way into the crowd about 25 yards from the stage, stood on a 4-foot-high riser and then fell backward into the audience. Instinctively the fans raised their hands to catch him and then passed him overhead back to the stage as he sang. The crowd surf soon became a staple of almost every performance: Springsteen counting on his fans to keep him aloft and safe and return him to his rightful perch. The fans, in turn, counting on Springsteen to continue singing, lift their spirits and envelop them in his wake. For Springsteen, rock ‘n’ roll has always been about making contact with his audience. He describes his songwriting, his albums, his concerts, the entirety of his career as an “ongoing conversation” with his fans. It is as much about them — their dreams, frustrations, failings and joys — as it is about him. Fans see themselves, or people they know, in the vast cast of characters that inhabit his songs and give them life. It’s a quintessentially American array: winners, losers, gamblers, hustlers, lovers, outcasts and desperadoes. No matter their station, they are strivers for a human connection, searchers for dignity and believers that a world exists where they can have their say. Doesn’t that just sound like preaching? Every Sunday, and all week long, we try to make contact with our audience and our Audience. We strive, in prayer and preparation, to connect the Holy with the humble, the yearning struggles of humanity with the aching heart of God, the crazy characters of scripture with the crazy characters of our congregations. We name our collective aches and pains and hopes and dreams, and try to speak words of promise to a better world. Both our congregations and the stories we tell from the Word of God are full of “winners, losers, gamblers, hustlers, lovers, outcasts and desperadoes… strivers for a human connection, searchers for dignity and believers that a world exists where they can have their say.” They fill the pews week after week to try and make contact with God and the ongoing conversation of faith. When we give ourselves over to the act of preaching, we get swept away by the Spirit, turn around and let ourselves fall backward, holding on to the microphone and singing as the Word comes, trusting the crowd to hold us up, carry us on the journey and return us safely to the platform again. They come yearning to get swept away themselves and counting on us preachers to lift their spirits and bridge the gap between the sacred and the mundane, the daily drudgery and the Divine. Falling backwards into the arms of the congregation, trusting them to hold us in our vulnerability to the Word. Being moved and swept along where the Spirit leads. Connecting with one another and with God. Crowd-surfing, Spirit-surfing, the art of preaching. B awoke this morning with a little cowlick like an alfalfa sprout sticking straight up above his forehead, like a unicorn’s horn emerging slightly skewed on his head. Looking in the mirror while washing his hands in the bathroom sink, he found this hysterically funny. Tonight, B told me the most elaborate story he has ever devised. It started when we were praying–he was repeating after me each line of the prayer. When it ended, he asked for more. While I was thinking about it, he said, “I have a prayer. You ‘peat after me.” This is what transpired. I left his room and immediately wrote it down, as best as I could remember. I’m grateful that I was repeating because it sealed some of his phrases in my head! There once was a dog. He didn’t have a father. He didn’t have a doghouse. He didn’t have a light. He was all alone. He had dog food. He had a hurt paw. He was walking. He had to go to the doctor. He walked to the doctor. He looked out for no cars. He was walking, he was not driving. He didn’t have a car. He was walking a long way to the doctor’s. When he got to the doctor, he didn’t have anything for shots. The doctor fixed up his paw. He went home. Now he had a doghouse. Then Santa—Santa is in my story too—then Santa came. He didn’t have any presents. Santa didn’t leave. Then he had one present. It was a tiny present. It was a really, really fast racecar. And they could be together. The end. I look forward to Christmas pageant Sunday. Not because I just get a Sunday off from preaching (which is nice), but because I just get to be a mom in church for awhile. Sure, I have to run the rest of the service–but from the time the pageant starts until the singing of the final carol, I slip into the pew next to my son. I get to handle his wiggling, shush his talking, introduce him to the hymnal, answer his questions and coax him to wear the shepherd’s hat and walk down the aisle with the other kids. Being a preacher’s kid can be tough. Everyone knows you, and thinks you should know them and talk to them like the preacher does. Everyone expects you to have exemplary behavior, and everyone is always paying attention. This is only complicated by the fact that I am not there to sit next to him in worship to coach him along. J does not come to church regularly, so he sits with the nursery worker and her family. So far, as he approaches his 3rd birthday, B has risen to the challenge and exceeded all reasonable expectations for good manners and church decorum. But I always treasure these (few) days when I get to be the parent in the pew. Like every other mom, I wanted him to be willing to put on the darling angel garland or brown fabric square and rough yarn that will transform him into a shepherd, to parade down the aisle and participate in the pageant. Like every young child, he resisted. Definitely no headgear for him, but his curiosity was piqued enough to go join the gaggle of kids up front to see the baby Jesus. And the three minutes I spent on the floor by the front pew, where I had walked him up front, where he was turning around to me and deciding whether to stay or go, pointing at the baby Jesus and smiling at me–those three minutes were priceless. And holding him, wiggling and restless in the back, waiting for his chance to go up front, when I can’t get him to stop talking because he’s so excited, when he whispers in my ear, “Look, Mommy! The ornaments on the tree are dancing!” because one of the angels has her wings caught on a low branch, I know why I love the Christmas pageant every year. I get to be mom, and nothing else, even for just a little while. 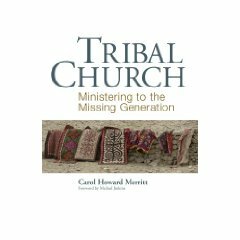 Tribal Church: Ministering to the Missing Generation, by Carol Howard Merritt. The Alban Institute, 2007. I used to be highly intrigued by authors and scholars who sought to define, categorize and understand my generation. I think I always wanted to know if I fit, to see myself in a new mirror, to determine if my personality is a non-conformist quirk or just part of my age-bracket territory. Now that I have settled comfortably into my mid-30s, I am less concerned with these personal expressions and more interested in professional insights about how we will reach out as a church to welcome other people in my generation. Merritt’s book promised just that sort of insight. The title alone, Tribal Church, made me think that she would lay out an elaborate twist on being and behaving as a church that would connect with other 20s and 30s. While I did not leave the book completely dissatisfied, I was disappointed that there was far more time spent cataloging the experiences of people in their 20s and 30s, and less time spent describing (even anecdotally) the way the church might look for them. Merritt’s look at life in your 20s and 30s provides great insight for pastoral concerns and community needs that will certainly be insightful to any church leader seeking to reach out to this generation. Rather than the classic approach of the “Me” generation or the cynical “Generation X,” she more accurately talks about the struggles of two-income parenting, student loan debt, parental care, stereotypes about lazyness, and the changing nature of work due to technology and contract labor. In the context of ministry, she talks about the need for community connections and the difficultly forming friendships and tribes. She does an excellent job with this–but it all felt like old news to me. Perhaps that is because of all those other books I have read on the same topic, or perhaps she just describes what I already know, because it’s my life! I wanted more prescription and less description from Tribal Church. What does a tribe really look like? What does a tribal church look like? How can leaders support the formation of tribes? Or can they? Merritt describes several ideas for informal connections and ministries that mainline churches can offer to people in their 20s and 30s, but they are mostly anecdotal. I want more. However, I think the reality is that most of my clergy colleagues, who are 20-40 years older, have absolutely no idea and no accurate portrait of life in my generation. In my regular interactions with them, they have no concept of life with two professional working spouses, of the constancy of geographic moves and the separation from extended family, of seminary debt and breastfeeding and technology, and even of the loneliness and lack of friendships. This book makes a great contribution if it is read by those older leaders with an open mind and heart. I can imagine myself lending this book out to lots of (older) clergy colleagues and citing it in church meetings when we are making programming decisions for our future. For me, the most helpful take-away from the book was the perspective that less is more, when it comes to church programming. It’s what I have secretly believed (and practiced) for a long time–but it goes against conventional wisdom. When children and parents are already overscheduled, the last thing they need is another church activity to overwhelm them. What they need is a space to be a family together, activities that engage all of them in quiet and reflection, in service and in sharing. A simple time to eat together and make friends across generations is a rare gift in today’s hectic world. This is what the church can offer people in their 20s and 30s, far more than glossy bulletins and contemporary music. Merritt covers this in far greater depth, including the challenges (even from my generation) in bucking conventional wisdom on church programs. Tribal Church is strong in its description and depiction of life as a 20- or 30-something today. Will we listen to the description? How will we respond?